When University of Wisconsin junior Erica Winters voted in the midterm election, she did not have a Wisconsin driver’s license or state identification to show poll workers. She did not have to show them any form of photo ID at all. Winters registered at the Madison Fire Department Nov. 2. Like many out-of-state student voters, she did so providing an electric bill as proof she had been living in Wisconsin for at least 10 days prior to the election. Under a new Wisconsin voting bill that will likely become law, Winters’ voting experience could soon become a thing of the past. The voter ID bill would require each eligible voter who attempts to register or vote at the polls on election day to present a valid Wisconsin driver’s license, a valid Wisconsin ID card from the Department of Transportation or a valid, current ID card issued to the person by a U.S. uniformed service. With very few exceptions, under the bill alternate forms of ID such as student IDs, proof of residency or corroborating witnesses will no longer be accepted. For young voters, a population traditionally not known for its high turnout rates, the impact of such a bill is unclear. At UW, where more than 17,000 of 42,000 students are non-residents, the bill would at best be a nuisance and at worst an obstacle that prevents a potential voter from heading to the polls. Is a student ID a state ID? For UW students, the most important question could be whether student IDs will be counted as a valid form of Wisconsin residency identification. David Canon, a UW political science professor, said it is possible the ultimate version of the bill sent to Walker’s desk may include student IDs as a valid form of identification, because a version of a voter ID bill from a previous legislative session did so. However, bill proponents such as author Rep. Jeff Stone, R-Greendale, and other sponsors do not necessarily support expanding the list of accepted voter ID. 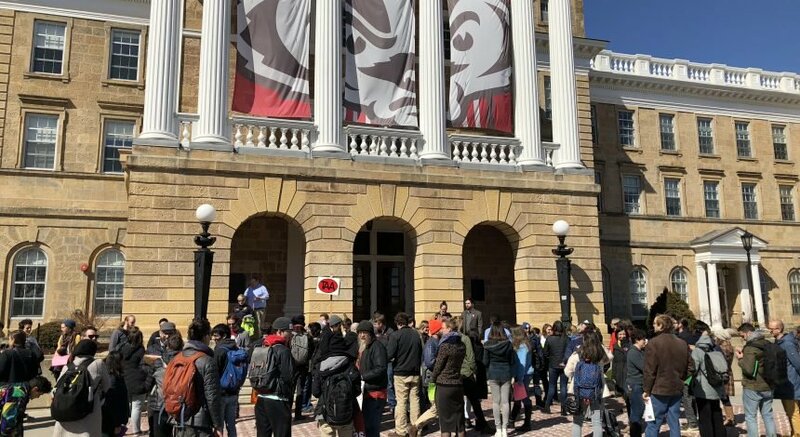 Sponsors and authors of the bill such as Stone are working with representatives from UW and the Board of Regents on how best to deal with out-of-state students with established residency in Wisconsin, according to spokesperson Mike Pyritz. “But we are hopeful that a person who is able to attend the university would have the wherewithal to acquire a state driver’s license or ID as well,” Pyritz said. Legislators may be hesitant to include UW IDs because they see the ability of foreign students to obtain UW IDs as problematic, Canon said, but added foreign students can also legally have driver’s licenses. That status as a non-citizen is actually recorded in the UW student records, while it is not recorded in the DOT records that are used to issue licenses of resident cards. In a way, that means the UW student ID is actually better than a driver’s license if legislators are worried about that specific type of fraud, Canon said. Student IDs also go through a similarly rigorous distribution process, and they are practically state-issued IDs already, at least for public universities, according to Andrea Kaminski, executive director of the Wisconsin League of Women Voters. Including student IDs would also reduce the cost of the bill because they are forms of ID that have already been distributed, Kaminski said. The Government Accountability Board also supports including student IDs as a form of accepted identification as a way to cut costs, according to Reid Magney, a GAB spokesperson. At the same time, accepting university IDs could complicate training for poll workers who would need training to authenticate student IDs and confirm they were unexpired, according to Pyritz. Even without student ID provisions in the bill, Stone is not concerned with depressed student voter turnout in the upcoming spring election. Nixing the student ID option could complicate the student voting process though. UW sophomore Molly Morrissey possessed a Wisconsin driver’s license when she voted at Gordon Commons in November. However, she did not have her license with her so her roommate signed a form corroborating her residency. Under the new bill, students like Morrissey would have the option of voting provisionally until they could provide state ID. Residency corroborations would no longer be accepted. Poll workers will count the ballot if the voter provides correct ID by 4 p.m. the day after the election to his or her polling place, the municipal clerk or board of election commissioners. However, Winters is from New York and did not already have a Wisconsin driver’s license waiting at home. She said if she had needed to obtain new Wisconsin ID to vote, she probably would have just voted absentee from her home state and abstained from voting in the several highly contested Wisconsin state government elections during the fall. Requiring out-of-state students to get new ID to vote would have an impact, Winters said, because ultimately students are not that mobile and not all have cars or a way to get to the DMV to get ID. The bill, which remains in the Senate, enjoys broad sponsorship in both Republican-controlled chambers of the Legislature with 46 co-sponsors. Gov. Scott Walker also supports the issue of stricter voter identification. Questions remain over if it will be passed in time for the April primary elections, and if its strict ID requirements will be expanded. The cost of implementing the new measures, which covers training for GAB poll workers and public information campaigns, works out to about $2,082,259, according to GAB estimates. The GAB estimates the cost will be much higher due to staff overtime and printing materials if it is implemented before April 2. Some opponents point to a 2005 UW-Milwaukee study when describing the potential impact of the voter ID bill, specifically the findings from census data that the majority of Wisconsin residents without ID are minorities who may not have the means to obtain ID. In response, the bill contains provisions allowing individuals to obtain state IDs for free at DMVs – driver’s licenses would still cost $35 – but some argue that is only part of the problem. There are an estimated 300,000 eligible voters in the state who do not have a driver’s license, a number disproportionately made up by elderly, minorities, the disabled and students, according to Canon. Although the bill is seen by many as a way to chip away at voter fraud, opinions on whether Wisconsin actually has a voter fraud problem differ. Figures for the 2010 midterm elections are not yet available, but according to the GAB, there were 24 cases of voter fraud in 2008, which breaks down to about 0.0008 percent. While the GAB maintains voter fraud numbers are low, Magney admits not all voter fraud is easily detectable. In general, Magney said there are policy concerns supporting the voter ID bill if the goal is to deter those who would vote illegally. In Wisconsin, that usually means felon voters. Wisconsin prohibits individuals from voting while still on parole for a felony. In 2008, of the reported fraud cases 14 were instances of felon voting. Magney said these new provisions could discourage felons from voting illegally but may not stop them because felons could still have photo ID. There is also the possibility that it will deter others from voting, not just felons or those who would vote fraudulently, Magney said. The GAB also regularly goes through state voter lists looking for discrepancies, according to Magney. In 2008 there were two cases of double voting, both in Milwaukee County. As well as being likely to pass, the voter ID bill is also no stranger to the Legislature. Former Gov. Jim Doyle vetoed versions of the voter ID bill three times during his tenure in office. Sponsors say at nearly its 10-year anniversary, the bill remains largely unchanged.